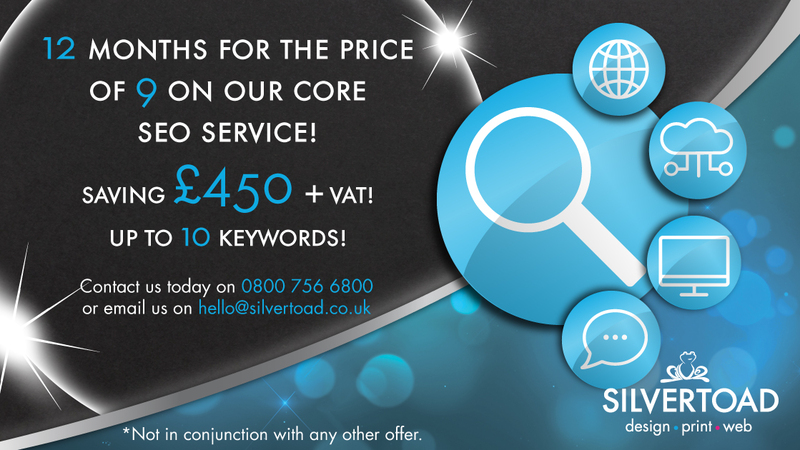 12 Months For The Price Of 9 On Our Core SEO Service! Most of us start our search for something we need, whether products by searching online using Google and other search engines. It goes without saying that if you’re not in the list, you’re not going to get found. Not easily anyway! As the old saying goes…you’ve got to be in it to win it! So the question is, when you search for the products or services you offer, can you find yourself online? If the answer is no then we have some great news for you! We’re offering a fantastic opportunity to get your online presence supercharged and your company being found online! For a limited time, you can sign up for our very popular SEO packages and get 12 months service for the price of 9, saving you £450.00+Vat! But hurry, this offer won’t be around for long! Search Engine Optimisation, commonly referred to as SEO, is the process of working on and enhancing a website with everything it needs to be found and gain top search engine rankings. This is a complex process of link building, on-site content management and on-going compliance which takes time to build up organically and is something that these days is essential to undertake continually. Organic SEO is a slow process and requires a long-term commitment to see real sustained success. SEO should be an on-going effort and importance associated with it for optimal results. There’s never a guarantee of placement or ranking online, but your on-going efforts and investment can make a significant positive impact on your results. We offer a 2-part service whereby we check and report on your website and how effective it is online and run our ‘website optimisation’ service to fix any issues, enhance the site with necessary changes and optimise it for the search engines. Starting from as little as £120.00 +Vat, this is the first step of improvements and the foundation for the monthly ongoing SEO service, which is what we use to improve and increase your website rankings on search. Join us and Join dozens of Silvertoad customers who are seeing fantastic online results! Silvertoad, based in Luton, Bedfordshire, provides a wide range of website design and development services, graphic design and printing solutions and a host of other marketing services.